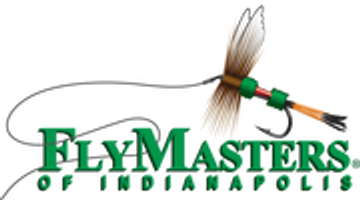 The information on this page is About FlyMasters of Indianapolis. If you are looking for location information and/or directions to our shop visit out Find FlyMasters page. If you need to contact us for any reason then visit our Contact US page. FlyMasters of Indianapolis FlyMasters of Indianapolis first open our doors in 1990. Our goal was to provide not only quality products for the fly fishing community but to bring the best service and expertise possible to our customers. Purchasing a fine rod or reel should only be the beginning of the FlyMasters experience. Talking with our experience and knowledgeable staff about any kind of fishing you are interested should be what completes your visit. FlyMasters has a fully qualified staff to assist you in all aspects of fly fishing. If you are interested in improving your casting, presentation, fly tying, rod building or locating a great fishing location, we can help. Indiana offers some excellent fly fishing. If you would like to catch smallmouth or largemouth bass, stripers, white bass, catfish, steelhead, trout, and carp we can give you advice on where, when and how to catch them. 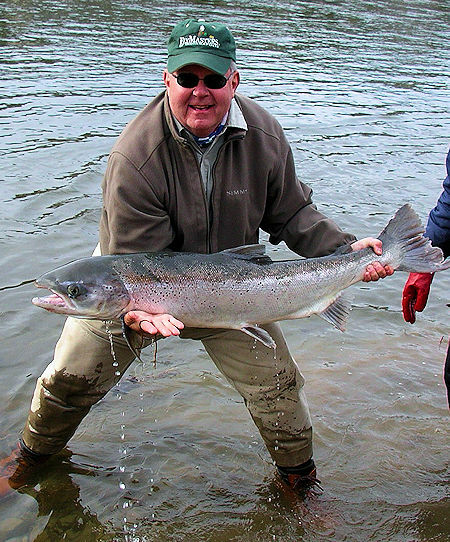 We can also help you plan a trip to many of the countries premier fly fishing destinations. FlyMasters would not be a complete shop if we did not offer instruction in fishing, fly tying and even building your own fly rod. We have the only complete and comprehensive Fly Fishing School in the state of Indiana. It doesn't matter what type of fly fishing you are interested in our fly fishing school can be tailored to your needs. We also carry the largest selection of fly tying materials in the Midwest. Whether you want to tie flies for Golden Dorado, trout, Muskie, Permit, or Bluegill we have the staff and materials to help you make those flies and catch more fish. If you are really interested in taking things to the next level we can help you build your own customer fly rods made to compliment your casting style and help you enjoy your time on the water even more. The staff at FlyMasters has grown considerably over the last 26 years with a very diverse body of knowledge and experience for you to draw upon. Below is some quick information on our staff and the things they like most in fly fishing. Although this will give you an idea of what FlyMasters is all about and the people that work here there is no substitute for stopping by the shop and talking fishing with us. You are always welcome! Jon Widboom is one of the original owners of FlyMasters when we first opened our doors in 1990. He currently is the sole owner of FlyMasters and Jon also teaches the Fly Fishing School at FlyMasters. Jon's major interest is in saltwater fly fishing. However, he is proficient in warm and cold water fishing as well, he prefers the big ones in the sea. 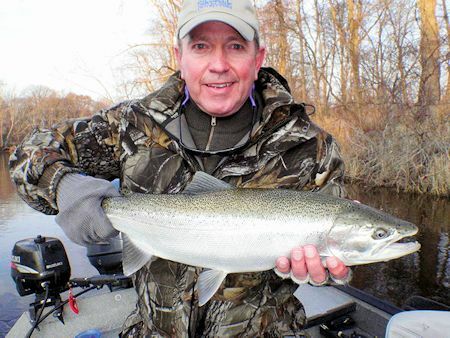 During the warm season in Indiana Jon is usually teaching and does not get as much time for fishing. Thus, when the weather is cold here he likes to find warmer climates and warmer fishing. 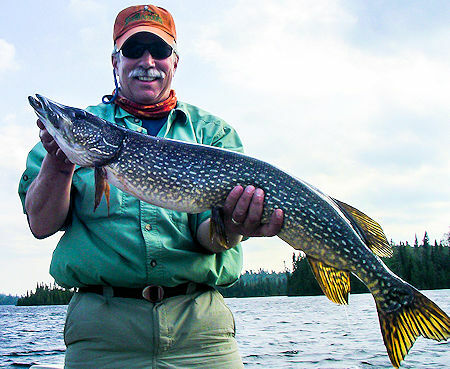 He also spends time casting after Pike, Musky and Lake Trout in Canada, trout, salmon and Grayling in Alaska, and even some salmon in New Brunswick and Scotland. Trout fishing in Pennsylvania and Michigan Steelhead are not out of the range of potential fishing (when he has the time). Derrick Filkins grew up fishing in the great trout streams of Northern Arkansas and Southwest Missouri. It is still his favorite place to fish. He now fishes the Smallmouth streams of Indiana and the great steelhead tributaries of the Great Lakes. Derrick does many guided trips for smallmouth during the warm months and steelhead and salmon when they are running. He loves to go striper fishing in the Northeast every fall and can't wait for ice out in the Saulte to fish for Coho, Kings, and Northern Pike. Derrick still does a small amount of Marriage and Family Therapy but now prefers recreational therapy in the form of taking novice fly fishermen on their first fly fishing trip. 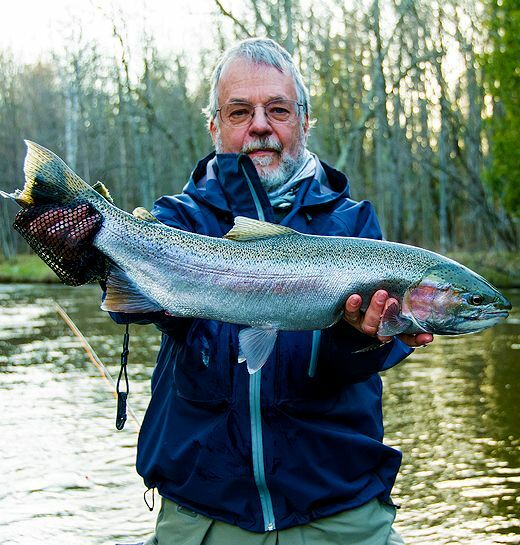 Although medicine (cardiothoracic surgery) has been Gary's vocation , fly fishing has been his avocation for over 30 years. Gary has been blessed with opportunities to experience the grandeur of fishing such locations as British Columbia, Quebec , Alaska, Maine, Montana, Ohio, Colorado, Kentucky, Arkansas, Tennessee, North Carolina, Florida, the Bahamas, as well as good old Indiana! However, he consider his favorite and home waters the rivers of northern Michigan especially the Au Sable where you can find him during most of his "get away" time chasing trout or upland game birds! Don Rollins grew up in New England. He began fishing with his father and paternal grandfather. Indeed, the only memories I have of my grandfather are fishing with him near his home in Maine. I never knew any fly fishermen growing up, except that I later learned that my grandfather was a fly fisherman when I tore up his equipment after he had died. I took up fly fishing at age 53 and taught myself to cast. I learned very early that fish are not very discerning about your equipment, or even your casting when I caught my first trout on a fly rod on a very poor back cast with my Cortland kit rod/reel combo. However, I soon learned that developing good techniques brings a lot more consistency to one's fishing results. I can be just as happy catching bass and bluegills as I am catching trout, and as I am fishing saltwater species. I honed my skills during the 12 years that I lived in Montana for 6 months each year, very near Yellowstone National Park. Along the way I have traveled extensively to fish for trout on 4 continents and for saltwater species on 4 oceans and seas. 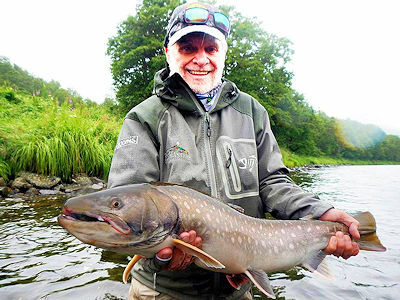 I have caught such diverse fish, as Pacific Sailfish and Lake Michigan Carp, such diverse fish as Tarpon and Smallmouth Bass, and such diverse fish as Permit and Rock Bass, and then most recently Kundzha Char on the Kamchatka Peninsula of Russia. Jack has always loved hunting and fishing, spending many days pursuing feather and fin while living in Southern Indiana. He has chased fish in many locations including Hawaii for billfish and tuna, Costa Rica for tropical species, Cabo for marlin and sailfish,the Bahamas for bonefish, and all across Canada and the Western US for trout ,salmon, and pike. He is also certified in scuba and enjoys spearfishing when in Hawaii. His favorite activity (other than fishing himself) is teaching his grandkids to fish. When not holding a fly rod, you may find him tending his orchids or tying flies.